This month I finally felt like I was really in the grove of blogging. Before, I was constantly posting on Facebook groups trying to promote my content and little by little I’ve been backing off of the Facebook threads. I used to try to do a Stumbleupon and a Click Through thread daily with other threads here and there but this month I only did the threads on Sundays and then on the last few days of the month. Even with cutting down significantly on sharing, I was able to maintain around my goal of 100 views per day or 3000 views per month. I’ve decided since now I’ve been reaching my goal pretty consistently, it’s time to set a new goal of 5000 views per month. I’ve been strategizing about how to increase my page views and one way is by increasing the amount of posts. When I first started this blog a year ago, I was posting three times per week. Needless to say, I very quickly burnt myself out and took a couple month break. Since January, I’ve consistently blogged once per week (Saturday) with an occasional extra post here and there. For July, I am going to publish new posts on Tuesday and Saturday and see how it goes. 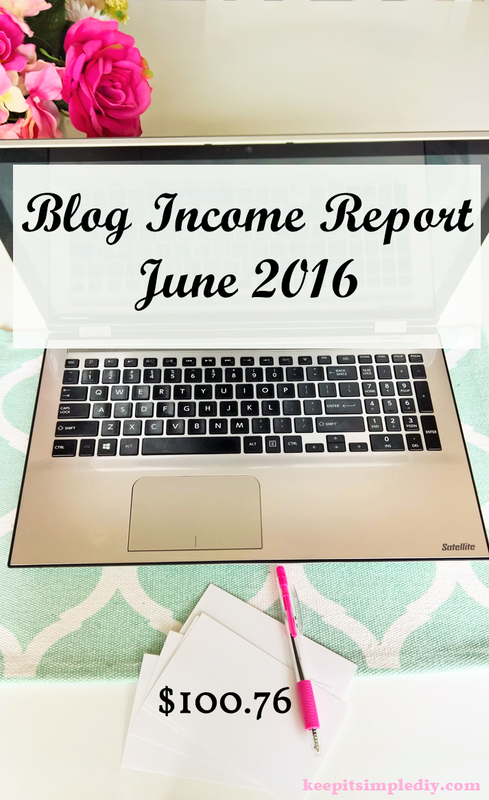 Even though I’ve continually decreased the amount of marketing of my blog, my income hasn’t decreased. At this point, I’m mainly only using ads to generate income but if a sponsored post comes up that fits with what I like to write about, I’ll take it. View Previous Blog Income Statements here. This month I also continued editing my old blog posts. It was a goal for the last few months to finish editing all of the posts so the images won’t be blurry (somehow my images blurred when I transferred from .com to .org). I did get about eight more posts done this month but now I’m planning to finish the rest in batches. As I’ve been nearing my blogiversary, I’ve been thinking of new ways to bring up old content. So, I’ve started posting old content to Twitter, Facebook, and Pinterest on Thursdays. This goes hand in hand with creating Pinterest worthy images for my old posts and revitalizing the posts. This sharing schedule is also helping me to have a deadline for completing the old post updates. I also did a lot of research on Pinterest this month. I redesigned my Pinterest Board images and I joined a handful of group boards. I’ve started using the free trial of Tailwind to schedule pins and am excited to see the results. Most excitedly, I created a goal to reach 500 followers on Facebook this month and not only did I reach 500 followers, but I exceeded 600 followers! Next month, I plan to brainstorm post ideas and see if I will be able to continue with two posts per week. I also am going to jump into Pinterest and see what scheduling pins is all about! Earlier this month, I felt stuck and like the blog wasn’t really going anywhere because my page views haven’t been increasing as my followers grow. Luckily, I remembered an old saying. “When you feel like you are about to give up, don’t. Success is right around the corner.” This thought re-energized me to continue. I hope the new strategy pays off! wonderful blog report here, am happy you were able to share this with your audience as not everyone does that, things like this motivates other to make even more push for success, thank you. Congrats! It looks like you have very specific goals and you’re moving towards them really successfully. Definitely helpful to post this, it’s inspiring to me to work on my own blogging schedule. Congrats! Sounds streamled process here. What do you use for ads? I use Google Adsense and Media.net. I haven’t really had any luck with Media.net though. It seems about 50/50 in the blogging world as to which works best for each blogger. I love that quote about success… it’s so true! I too am focusing on Pinterest more. I have tailwind and I use it when participating in repin threads but I have not been sitting down daily to just schedule pins. That is my goal for the remainder of the month. Thanks for sharing! Another great report and a nice increase in income from last month. I haven’t used it yet, but I was recommended this plugin to help “Revive Old Posts” https://en-gb.wordpress.org/plugins/tweet-old-post/. Might automate things for you so you can concentrate on those 2 posts a week. I actually do use that plugin. I only use it for Twitter though because you have to set the same intervals for all platforms used through the plug in. I have it tweeting about six times a day and I only post older posts to Facebook once on Thursdays. The Plugin works great though other than that small part. Thanks for the tip! Congratulations! I know it feels amazing to see your traffic and income increasing. Thank you for posting your income reports. They are very inspiring! Congrats on seeing your traffic steady without consistent sharing! I am working on that as well. My focus has been to Pinterest as well which has helped a ton. I made all my images Pinterest friendly and started sharing about a month ago/switching my personal page to a business page. Now half my traffic comes from Pinterest with minimal work! Good luck on reaching that goal of 5000 page views. That is my goal for this month. Kari, it is awesome to see you building your blog. Summer seems to be a slow time, but spring showed real promise, especially on revenue. Autumn into winter you should really rock on traffic and revenue. I just applied for AdSense myself so learning about it. Thanks for this behind the scenes look starting to monetize your blog. I’ll look forward to your updates!